Digital and data specialists will help patients, clinicians and carers benefit from better technology. Digital and data specialists from NHSX will team up with NHS England’s cancer and mental health national policy teams to help clinicians and policymakers improve patient experience through technology. If this is successful it will be rolled out more widely across the NHS. NHSX is the new joint organisation for digital, data and technology. Its mission statement is to make sure patients and staff have the digital technology they need. From July, NHSX will mandate the use of internationally recognised technology and data standards across the NHS to ensure all systems can talk to each other. NHSX wants to assemble a world-class team of technical experts, including a Chief Technology Officer, to help solve some of the biggest challenges in health and care. It will begin recruiting in the summer. Matthew Gould has been named CEO of NHSX and will join the organisation in the summer. Matthew is currently the Director General for Digital and Media at the Department for Digital, Culture, Media and Sport. He was previously Director for Cyber Security at the Cabinet Office and a former ambassador to Israel. Matthew will have strategic responsibility for setting the national direction on technology across health and social care organisations. He will be accountable to the Health and Social Care Secretary and Chief Executive of NHS England. Current reporting lines will remain in place until NHSX becomes operational in July. It will be led in the interim by a senior team from NHS England and the Department of Health and Social Care. I love the NHS – it has been there for all of us for more than 70 years and we owe the incredible doctors, nurses and care workers an enormous amount of gratitude for their dedication. NHSX will be led by the brilliant Matthew Gould, and will harness the full potential of technology to improve patient experience and make our NHS the very best it can be. Matthew has a wealth of experience in managing large digital projects and I am delighted to have him on board. I want to invite the very best talent to join NHSX. If you’re an innovator and you want to serve our society, I want to welcome you to join the growing band of HealthTech pioneers at NHSX who are going to be on a mission to harness technology to save lives. We want to invite brilliant people from government, NHS and industry will work closely with clinicians to cut through bureaucracy – meaning patients get access to the best innovations more quickly. NHSX is one of the most exciting things happening in the UK. It’s cutting edge, it’s mission driven and it’s about harnessing the best. This is just the beginning of the tech revolution, building on our NHS Long Term Plan to create leading health and care service – for us all. 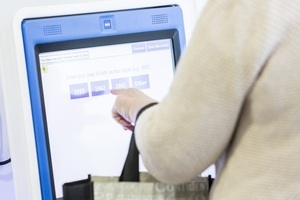 The NHS Long Term Plan builds on significant recent progress to a more digital NHS, from providing free WiFi, to helping the most advanced hospitals push the latest advances, to an Apps Library showcasing a range of digital tools that can help the public take charge of their own health. To ensure the benefits of new digital technology can reach patients right across the country, experts from the NHS and government will be working closer together as part of NHSX to help the NHS go further, faster. Our single goal will be to improve the care that everyone in the country gets by making sure that both staff and patients have the technology they need. I will know I have succeeded if in 2 years we have reduced the crazy amount of time that clinicians spend inputting and accessing patient information, if we have given patients the tools so they can access information and services directly from their phones, and if we have started to build a system in which patient information can be securely accessed from wherever it is needed, ensuring safer and better care as patients move around the system, and saving patients from having to tell every doctor and nurse their story over and over again.